What’s the purpose driving your approach to Connect the Dots’ events? Bringing people together around a topic that matters; to create an authentic and meaningful connection between clients. Each event has an undercurrent of social impact and a strategic purpose. How did Connect the Dots form? It started as a Master’s project. It was a slow realisation that we had something good here, after our first event we had really good feedback and 100% attendance. Those attendees then asked us to apply what we were doing to other topics such as sustainability, entrepreneurship. We noticed there was a kind of event fatigue, where you’d go to an event and get one good business card, or hear one good speaker. We thought the best way to get people to come to events was to talk to them first. Our master’s was on design thinking, so ‘people first’ thinking – which is all about mapping out what people want and need. What impact does this business enable you and your co-founder to make? We really care about the city and how the people in it function – and we noticed how disconnected people were. So we first started looking at the issue of vacant space in Dublin – there’s so many people with the same ideas and problems and no one is talking to each other. So we facilitated networking between people as our first event. 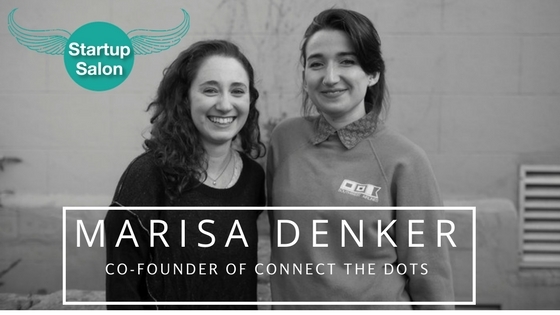 What would have done differently had you known Connect The Dots would end up becoming a startup? One thing we’ve learned is valuing our time and the time of others. We had a lot of people in the beginning who volunteered for our cause without pay, though we try to pay them and ourselves as we believe everyone’s time should be valued. Also, going into this with a business background would have helped! I’ve been taking little courses on the side, but it would have been helpful to have a strategic or a marketing background to help make decisions. What’s the best way to ensure people value your time? Being direct is very important, such as giving a price without delaying. If we have clients who can’t afford our full price we will lower our costs to help, especially if they’re a non-profit. We want to balance our time with still helping whoever we’re working with. We call it a social enterprise, it’s a very new term here in Ireland. You can’t sign up your business as a social enterprise here, like you can in the States. People don’t seem to value social impact stuff as much, and so social enterprise is trying to push the thought that people should be paid for the good works that they do – which all comes down to the valuing time part. Most of our profits go back into the business or the causes we care about, though we don’t fit entirely into either the non profit or for profit category. What’s next for Connect the Dots? Our strategic goal would be to get bigger clients in to help us afford to do more projects, which would help us help more non profits at a lower cost. Our new website is launching soon, so we’re going into sales mode! Locking down more specific target markets. Doing something you’re passionate about, that makes you happy. When work doesn’t feel like work, when you really enjoy it. Making new people and watching them connect with each other, watching people’s lives change because of the impact of your event.